Mangalia (Romanian pronunciation: [maŋˈɡali.a], Turkish: Mankalya, ancient Callatis (Greek: Κάλλατις/Καλλατίς; other historical names: Pangalia, Panglicara, Tomisovara) is a city and a port on the coast of the Black Sea in the south-east of Constanța County, Romania. The municipality of Mangalia also administers several summer time seaside resorts: Cap Aurora, Jupiter, Neptun, Olimp, Saturn, Venus. The Greek town Callatis existed until the mid 7th century under this name. Life in the town resumed from the 10th century. In the 13th century Callatis came to be known as Pangalia. The Vlachs called it Tomisovara and the Greeks called it Panglicara. From the 16th century the town had acquired its present name, Mangalia. A Greek colony named Callatis was founded in the 6th century BC by the city of Heraclea Pontica. Its first silver coinage was minted around 350 BC. In 72 BC, Callatis was conquered by the Roman general Lucullus and was assigned to the Roman province of Moesia Inferior. Throughout the 2nd century AD, the city built defensive fortifications and the minting of coinage under the Roman emperors Septimius Severus and Caracalla continued. Callatis suffered multiple invasions in the 3rd century AD but recovered in the 4th century AD to regain its status as an important trade hub and port city. From the 7th to the 11th century the city was under the rule of the First Bulgarian Empire. Mangalia is positioned at 43°49’ latitude and 28°35’ longitude, with an approximate elevation of 10 meters, 44 kilometres (27 miles) south of the municipality of Constanţa, on the same latitude as the French resort of Nice. Mangalia is one of the southernmost resorts on the Romanian coast of the Black Sea. Mangalia is characterized by a moderate maritime climate (annual average temperature 11 °C (52 °F) - one of the highest in Romania) with hot summers (July average over 21 °C (70 °F)) and mild winters (January average 1 °C (34 °F)), Mangalia being the country's second place, after Băile Herculane, with positive average temperatures in wintertime. Spring comes early but is cool and autumn is long and warm. In summer, cloudiness is reduced (about 25 sunny days in a month) and the duration of sunshine is of 10–12 hours a day. Annual precipitation is low (about 400 mm (16 in)). The sea breeze is stronger in summer. The natural cure factors are the water of the Black Sea, which is chlorided, sulphated, sodic, magnesian, hypotonic (mineralization 15.5g), the sulphurous, chlorided, bicarbonated, sodic, calcic, mesothermal (21-28 °C) mineral waters of the springs in the northern part of the city, in the area of the beach between Saturn and Venus, the sulphurous peat mud, rich in minerals, which is extracted from the peat bog north of the city (expected to last another 250 years) and the marine climate, rich in saline aerosols and solar radiation that have a bracing effect on the organism. The resort has a large, fine-sand beach developed for purposes of aeroheliotherapy and wave therapy, as well as high seawalls with a specific microclimate where one may benefit from inhalations of saline aerosols having therapeutic effects. At the 2011 census, 90.6% of the city's residents were ethnic Romanians, 4.4% Turks, 3.6% Tatars, 0.5% Roma, 0.3% Lipovans, and 0.6% belonged to other ethnic groups. According to religion, for respondents for whom data is available, 89.5% were Romanian Orthodox, 8.3% Muslim, 0.9% Roman Catholic, 0.3% Pentecostal, and 1% other or none. A telephone tower in Mangalia. The current mayor of Mangalia is Cristian Radu (Independent). Wikimedia Commons has media related to Mangalia. 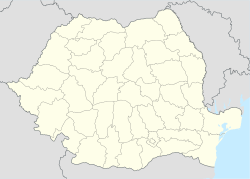 ^ "Constanta County at the 2011 census" (PDF) (in Romanian). INSSE. February 2, 2012. Archived from the original (PDF) on March 24, 2012. Retrieved March 8, 2012. ^ Preda, C. 1968: Callatis. Bucharest. ^ a b Innocenzi, Alfredo (2016-03-01). Dobrogea:o frontiera uitata (in Romanian). Youcanprint. ISBN 9788893328678. ^ Michael Grant, A Guide to the Ancient World, New York: Barnes and Noble Books 1997, p. 140. Alexandru Avram. Kallatis. - In: Ancient Greek Colonies in the Black Sea. Vol. 1. Eds. Dimitrios V. Grammenos and Elias K. Petropoulos. Oxford, Archaeopress, 2001 (BAR International Series; 1675 (1-2)), 239-286. This page was last edited on 2 April 2019, at 10:48 (UTC).